One of the perks of Valentine’s Day falling on a weekend this year is the opportunity to make a special breakfast for the three valentines in my life – my dear husband, delightful two-year old daughter and cuddly new 7-week old son. Well, that last one doesn’t really get to enjoy any, but it’s the thought that counts. I’ve often wondered what crepes might be like on the panini grill (when you write a panini blog, these are the things that occupy your thoughts). Would they maintain their soft texture? Would the pancakes stay intact? I’m pleased to report the answers to those questions are “yes” and “yes”. 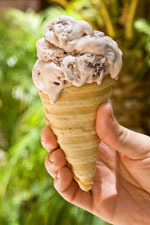 This post on the Stone Spoon blog ultimately convinced me to give it a try. So this year I will be treating my valentines to Ham, Egg & Cheddar Breakfast Crepes: sliced ham, a one-egg omelet and cheddar cheese rolled in a savory crepe and grilled on the panini press. With a little sundried tomato purée heart on the side. I really should make crepes more often. I tend to psych myself out, thinking it’ll be too hard to get them to come out right. But when I actually start swirling them in a skillet I always get the hang of it after a few tries. It sounds like a lot of work to make both the crepes and the omelets before grilling but in reality they only take a few minutes each. The sundried tomato purée, aside from looking cute on the plate, adds a nice sweetness to the crepes. If you don’t have a panini press, you can certainly make these in a regular skillet. In fact, you don’t even have to make the omelet separately, as I learned in this post on Baking Bites. The most important thing is how they taste and they taste great no matter how you make them. Preheat the panini grill to medium heat. Place one crepe on a clean work surface. Place one omelet on top of the crepe (the omelet should be about the same size as the crepe). Layer a slice of cheese and ham on top of the omelet. 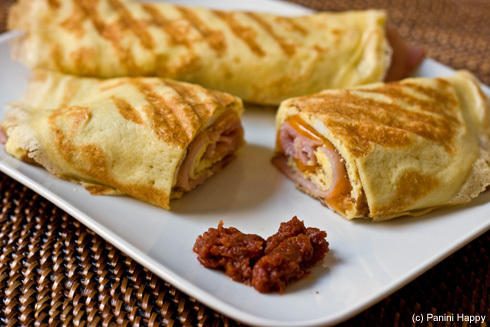 Carefully roll up the crepe and place it on the panini grill, seam side down. Grill for about 2 minutes until the cheese is melted and golden grill marks appear on the crepe. Place a nonstick or seasoned crepe pan (a 7-1/2″ skillet will work as well) over medium heat. Coat the pan with a little unsalted butter. Stir the batter and pour about 2 tablespoons into the pan, lifting the pan off the heat and tilting and rotating it so that the batter forms an even, very thin layer. Cook until the top is set and the underside is golden. Turn the crepe over, using a spatula or your fingers (fingers work best here) and cook until the second side is lightly browned. Remove the crepe to a piece of wax paper. Continue cooking the rest of the crepes, buttering the pan and stirring the batter before starting each one. Stack the finished crepes between sheets of wax paper. 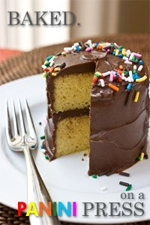 Use immediately or let cool, wrap airtight, and freeze for up to 1 month. Make each omelet one at a time, ideally just prior to rolling into crepes. Heat a small skillet (you might use the same one as for the crepes) over medium heat. In a small bowl beat one egg with a splash of milk and salt and pepper to taste. Pour egg mixture into the skillet and cook until the top is set and the underside is browned. Flip with a spatula and cook the other side until cooked through. Stuffed crepes! On the panini press! That’s a great idea, Woman. What a great alternative to the common breakfast sandwich. And now (of course) my brain is thinking of all sorts of variations on this theme… savory and sweet. Thanks for the inspiration. I wanted to print the recipe for the breakfast crepes, however you don’t have a way to print only the recipe. I mwould have to print the entire page which would be a waste of paper and ink. Is there any thinking about developing a print program on your website? Hi Richard – Yes, I do actually have a print function on Panini Happy. It just happens to be disabled at the moment as I just changed over the blog to a new design this week. I hope to have the print functionality back up and running this weekend. With your cursor, highlight just the part of the page that contains the recipe. To do that, place your cursor just before the first word you want to highlight, then left click your mouse and drag down and across to where the recipe ends. Now that it’s highlighted, hit CTRL and the “C” key on your keyboard to copy it. Now open whatever word processing program you use (I usually just use WordPad). Left click your mouse in the upper left corner of the document, then hit CTRL and the “V” key to paste the recipe in place. Voila! You’re ready to print! Thanks for the helpful workaround, Nick. The link to print should be back up and running now, just below the title of each post. Thanks for your patience! You’re welcome, Kathy. You might want to delve a bit further into setting up the Print function. When I tried it, it still included the entire post, as opposed to just the recipe. My printer spits out four pages. Not a big deal for me, as I’m used to the copy/paste method, but thought you might like to know. excellent idea from start to finish but my favorite part is your simple heart made from sun-dried tomatoes. it’s a heart! made from sun-dried tomatoes! yay! So cute! Love the heart. You might actually get me to try to make a crepe after reading this. Happy Valentines Day! Hummm…I’ve grilled my crepes on a skillet and fry pan but hadn’t thought of a crepes on a panini maker. Great idea! .-= Ashley´s last blog ..Feb 11, Simple Chicken Salad Recipe – Recipe for Crepes =-. These look great. I think I’m going to try them with a few tortillas instead of the crepes. Hopefully it works! .-= Andrew Davis´s last blog ..Lechon Asado: Puerto Rican Style Slow Roasted Pork =-. Grilled breakfast burritos – there you go! They turned out ok. I think the crepe sounds like a much better option. The breakfast burrito worked, but needed something else. Not sure what. .-= Andrew Davis´s last blog ..Juice: Spiced Apple Pie =-. Aw man, that’s how it goes sometimes, eh? You inspired me to try grilling breakfast burritos too! Bought ingredients – eggs, bacon, cheddar, potatoes (with green peppers & onions) and salsa on the side. Hoping to make them soon. These would make for a really nice weekend breakfast! Oh wow that would make a perfect breakfast for a special day!!! yum! .-= Sook @ My Fabulous Recipes´s last blog ..Black Pepper Chicken =-. Wow this is so creative and looks just delicious! .-= Simply Life´s last blog ..Vegetable Herb Chowder with Whole Wheat & Flaxseed Bread! =-. Oh my, You’re a genious. Saw you listed on the blog roll. Glad I found you. .-= Ash´s last blog ..Valentines Day Ravioli =-. My crepe-making abilities are laughable. Usually it all just falls apart into a nice blob. Tastes good though! This is an awesome way to use crepes. Lovely! This is the first time I visit a website dedicated to panini’s and I must say I’m quite amazed at all those possibilities! 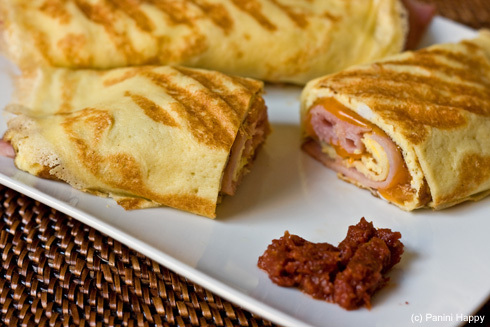 This breakfast crepe simply looks delicious. Maybe a bit rich for every day, but would be great for weekends or special occasions! Thanks for the great recipe! I made this for my mom just to surprise her, and SHE LOVED IT! I will definitely be making more of these! That’s terrific, Sophia – I’m so glad they were a hit!